oh weird, half my message isn't showing, not from my end of the www anyway, LOL! Shoot, what did I write, oh yeah. The <script info is there both opening and closing. Sorry Denise, I just have to go to bed. I will look at it in the morning, or is that your nighttime?..Nite! Secondly your two middle images don't seem to have been uploaded or the incorrect URL's are listed. - No.. you do not need to leave those links in. You're supposed to replace those links with your own - BUT, only if you want your images to link to a page. If you don't want the images to link, then just leave as "". widget. Thank you in advance to anyone that might be able to help me. 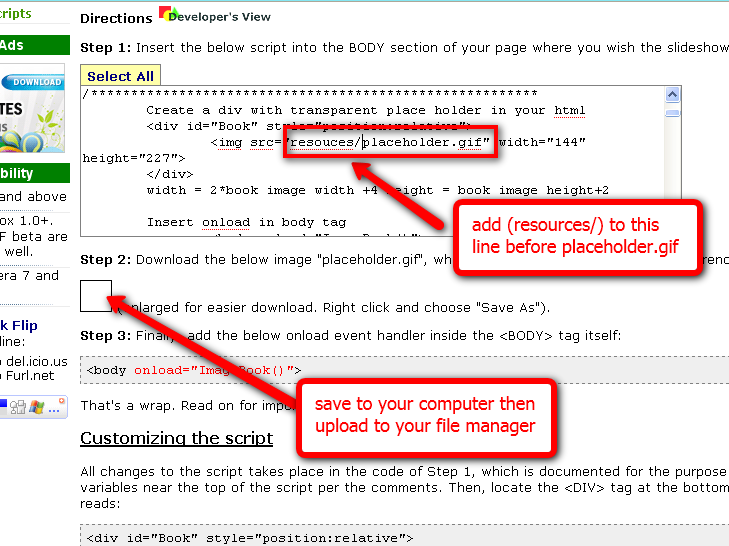 Step 3: Change the image path below to your own image urls. This is found in your 1st HTML widget. Step 4: Be sure to change the image path to where you have your placeholder image. You'll find this near the top in your 1st HTML widget. Give that a whirl and see if it works out for you. Be sure to save. Please note that you may not see it working right away. Just hit your refresh button and it should come up. I don't know what is happening to my posts here but I did write and thank you for all your time on this little:( I don't see the message though so all I can figure is my internet is just running so slow:( I think that is about 50% of my problem but I am so far out in the country I don't have a better option then what I am already using. You got it right the first time! =) It replaces the "photo1.jpg". The link "http://www.dynamicdrive.com" is for you to put your own link in if you want your picture to link to a particular page. You DO NOT have to have this. If you don't want the picture to link, then simply erase the link so that it ends up looking like "" (2 double quotes together). Hello little, it is working fabulously! I do have to tweak the size and now I am looking at adding the wood border which is part of my page "theme". If you see this and know how I might implement that I would appreciate your guidance. Although I am searching the web on "how to" and the yola forums re: borders on images etc. PS Would you tell me where I had gone wrong in my code little so I will know next time when I will surely want to build another slideshow;)? I'm glad that you got the slideshow working. You will find with any slideshows that you may need to tweak it a little to fit your image sizes. Hi Denise....I see you are using Amazon for your general store...I had thought of doing a little of that also with them.I am curious to know how you like it.If you add any of their home decor items let me know and then our sites relate enough for linking.When you are ready I also know of places where you can list your products for free and they will link back to your product pages.Some places you can list free and just add your PayPal or Google Check Out info to sell right there on their sites.